These Inbound Marketing tips offer practical ideas to differentiate your business. Does your company appear on the radar of prospective buyers? If so, what happens next? A well-constructed, multi-faceted marketing plan is essential for ensuring that your business rises above the fray to attract prospects, retain their interest, and convert them into qualified sales leads. Your marketing strategies must capitalize on opportunities to increase your company’s exposure and educate prospective customers on your solutions to their specific business needs. 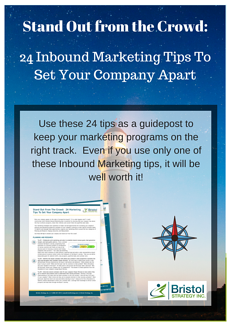 These 24 Inbound Marketing tips will provide practical ideas and insight to differentiate your business. It is so difficult to establish a positive compass for any business in today's rapidly changing business environment. Use these 24 tips as a guidepost to keep your marketing programs on the right track. Even if you use only one of these Inbound Marketing tips, it will be well worth it.